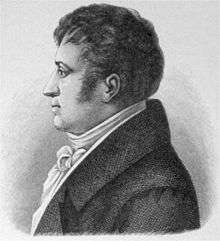 August Wilhelm (after 1812: von) Schlegel (8 September 1767 – 12 May 1845), usually cited as August Schlegel, was a German poet, translator and critic, and with his brother Friedrich Schlegel the leading influence of Jena Romanticism. His translations of Shakespeare turned the English dramatist's works into German classics. Schlegel was also the first professor of Sanskrit in Continental Europe and produced a translation of the Bhagavad Gita. Schlegel was born in Hanover, where his father, Johann Adolf Schlegel, was a Lutheran pastor. He was educated at the Hanover gymnasium and at the University of Göttingen. Initially studying theology, he received a thorough philological training under Heyne and became an admirer and friend of Bürger, with whom he was engaged in an ardent study of Dante, Petrarch and Shakespeare. Schlegel met with Caroline Böhmer and Wilhelm von Humboldt. 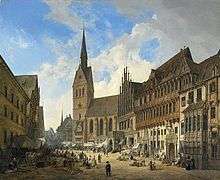 In 1790 his brother Friedrich came to Göttingen. Both were influenced by Johann Gottfried Herder, Immanuel Kant, Tiberius Hemsterhuis, Johann Winckelmann and Karl Theodor von Dalberg. From 1791 to 1795, Schlegel was tutor for the children of Mogge Muilman, a Dutch banker, who lived at the prestigious Herengracht in Amsterdam. In 1796, soon after his return to Germany, Schlegel settled in Jena, following an invitation of Schiller. That year he married Caroline, the widow of the physician Böhmer. She assisted Schlegel in some of his literary productions, and the publication of her correspondence in 1871 established for her a posthumous reputation as a German letter writer. She separated from Schlegel in 1801 and became the wife of the philosopher Schelling soon after. In Jena, Schlegel made critical contributions to Schiller's Horen, to that author's Musen-Almanach, and wrote around 300 articles for the Jenaer Allgemeine Litteratur-Zeitung. He also did translations from Dante and Shakespeare. This work established his literary reputation and gained for him in 1798 an extraordinary professorship at the University of Jena. His house became the intellectual headquarters of the "romanticists", and was visited at various times between 1796 and 1801 by Fichte, whose Foundations of the Science of Knowledge was studied intensively, his brother Friedrich, who moved in with his wife Dorothea, Schelling, Tieck, Novalis and others. In 1797 August and Friedrich broke with Friedrich Schiller. With his brother, Schlegel founded Athenaeum (1798–1800), the organ of the Romantic school, in which he dissected disapprovingly the immensely popular works of the sentimental novelist August Lafontaine. He also published a volume of poems, and carried on a rather bitter controversy with Kotzebue. At this time the two brothers were remarkable for the vigour and freshness of their ideas, and commanded respect as the leaders of the new Romantic criticism. A volume of their joint essays appeared in 1801 under the title Charakteristiken und Kritiken. His playwright Ion, performed in Weimar in January 1802, supported by Goethe, became a failure. 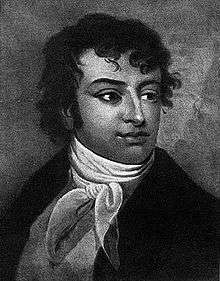 In 1801 Schlegel went to Berlin, where he delivered lectures on art and literature; and in the following year he published Ion, a tragedy in Euripidean style, which gave rise to a suggestive discussion on the principles of dramatic poetry. This was followed by Spanisches Theater (2 vols, 1803/1809), in which he presented admirable translations of five of Calderón's plays; and in another volume, Blumensträusse italienischer, spanischer und portugiesischer Poesie (1804), he gave translations of Spanish, Portuguese and Italian lyrics; his translations included works by Dante and Camões. Schlegel's translation of Shakespeare, begun in Jena, was ultimately completed, under the superintendence of Ludwig Tieck, by Tieck's daughter Dorothea and Wolf Heinrich Graf von Baudissin. This rendering is considered one of the best poetical translations in German, or indeed in any language. Schlegel's sister-in-law (his brother Friedrich's wife) was an aunt of composer Felix Mendelssohn. In 1826, Mendelssohn, at the age of 17, was inspired by August Wilhelm's translation of Shakespeare's A Midsummer Night's Dream to write his concert overture for A Midsummer Night's Dream. After divorcing his wife Caroline, in 1804, Schlegel traveled in France, Germany, Italy and other countries with Madame de Staël, as tutor to her sons and adviser in her literary work. She owed to him many of the ideas which she embodied in her work, De l'Allemagne. In 1807 he attracted much attention in France by an essay in the French language, Comparaison entre la Phèdre de Racine et celle d'Euripide, in which he attacked French classicism from the standpoint of the Romantic school. His lectures on dramatic art and literature (Über dramatische Kunst und Literatur, 1809–1811), which have been translated into most European languages, were delivered at Vienna in 1808. From 1813 to 1817, he acted as secretary of the crown prince of Sweden, through whose influence the right of his family to noble rank was revived. After this, he joined again the household of Mme. de Staël until her death in 1817. Schlegel was made a professor of literature at the University of Bonn in 1818, and during the remainder of his life occupied himself chiefly with oriental studies. He founded a special printing office for Sanskrit. As an orientalist, he was unable to adapt himself to the new methods opened by Bopp. He corresponded with Wilhelm von Humboldt, a linguist. He continued to lecture on art and literature, in 1827 published On the Theory and History of the Plastic Arts, and in 1828 issued two volumes of critical writings (Kritische Schriften). In 1823-1830 he published the journal Indische Bibliothek and edited (1823) the Bhagavad Gita with a Latin translation, and (1829) the Ramayana. This was followed by his 1832 work Reflections on the Study of the Asiatic Languages. After the death of Madame de Staël, Schlegel married (1818) a daughter of Heinrich Paulus, but this union was dissolved in 1821. In 1835, Schlegel became head of the committee organising a monument to Ludwig van Beethoven in Bonn. He died in Bonn in 1845, three months before the official unveiling of the Beethoven Monument. As an original poet Schlegel is unimportant, but as a poetical translator he has rarely been excelled, and in criticism he put into practice the Romantic principle that a critic's first duty is not to judge from the standpoint of superiority, but to understand and to “characterize” a work of art. Schlegel established models for the new method of analytical and interpretative criticism in his essays on Goethe's Hermann and Dorothea and on Shakespeare's Romeo and Juliet. His Vienna lectures On Dramatic Art and Literature were translated into most of the languages of Europe and stand as a permanent contribution to critical literature; his definition of the terms “classic” and “romantic” met with general recognition; his views on the so-called “three unities” and on the “correctness” of Shakespeare evoked an especially strong echo in England and finally made the Johnsonian attitude toward Shakespeare appear obsolete. Formal perfection of language is the chief merit of his poems, which suffer from a lack of originality. In his drama Ion, he vainly attempted to rival Goethe's Iphigenie. He prided himself on being “model and master in the art of sonnets” among the Germans. He is at his best in sparkling literature parodies such as Ehrenpforte und Triumphbogen für Kotzebue (1801). [Schlegel's] Spanisches Theater (1803-09), consisting of five pieces of Calderon's, admirably translated, . . . [made] that poet a favorite with the German people, and his Blumensträusse der italienischen, spanischen und portugiesischen Poesie (Berlin, 1804), a charming collection of southern lyrics, [marks] the appearance of . . . the naturalization in German verse of the metrical forms of the Romanic races. 1 2 3 4 Reynolds, Francis J., ed. (1921). "Schlegel, August Wilhelm von". Collier's New Encyclopedia. New York: P.F. Collier & Son Company. 1 2 3 4 5 6 7 8 9 10 11 12 Anonymous 1911. 1 2 3 4 5 6 Traugott Böhme 1920. ↑ Dirk Sangmeister, Der Lieblingsdichter der Nation..., article in German newspaper Die Zeit no. 31, 1999. ↑ Portland Chamber Orchestra Archived August 7, 2008, at the Wayback Machine. This article incorporates text from a publication now in the public domain: Gilman, D. C.; Thurston, H. T.; Colby, F. M., eds. (1905). "Schlegel, August Wilhelm von". New International Encyclopedia (1st ed.). New York: Dodd, Mead. This article incorporates text from a publication now in the public domain: Anonymous (1911). "Schlegel, August Wilhelm von". In Chisholm, Hugh. Encyclopædia Britannica (11th ed.). Cambridge University Press. This article incorporates text from a publication now in the public domain: Böhme, Traugott (1920). "Schlegel, August Wilhelm von". In Rines, George Edwin. Encyclopedia Americana. Wikisource has the text of the The Nuttall Encyclopædia article Schlegel, August Wilhelm von. Hay, Katia D. "August Wilhelm von Schlegel". Stanford Encyclopedia of Philosophy.